The recent Intergovernmental Panel on Climate Change (IPCC) report demonstrates that the organization lacks credibility as the report backtracks on previous climate change claims while making other statements not supported by evidence say Friends of Science. With no global surface warming for 16 years, the IPCC are at a loss to explain this ‘hiatus’; Friends of Science say simply the IPCC’s original premise was wrong - the sun drives climate change, not carbon dioxide (C02). Recent media op-eds and reports have continued to claim impending doom from climate change and global warming, but the Intergovernmental Panel on Climate Change (IPCC) report released September 27, 2013 backtracks on previous catastrophic predictions, say Friends of Science. Consequently, they say the push for more carbon taxes and low-carbon legislation should be rejected by taxpayers. Though the IPCC tried to dismiss the significance of the warming hiatus, the temperature index from the UK Met Centre shows an actual cooling trend of 0.07 C/decade from 2002 and no warming for 16 years. The IPCC predicted that the warming trend would be about 0.20 °C/decade. 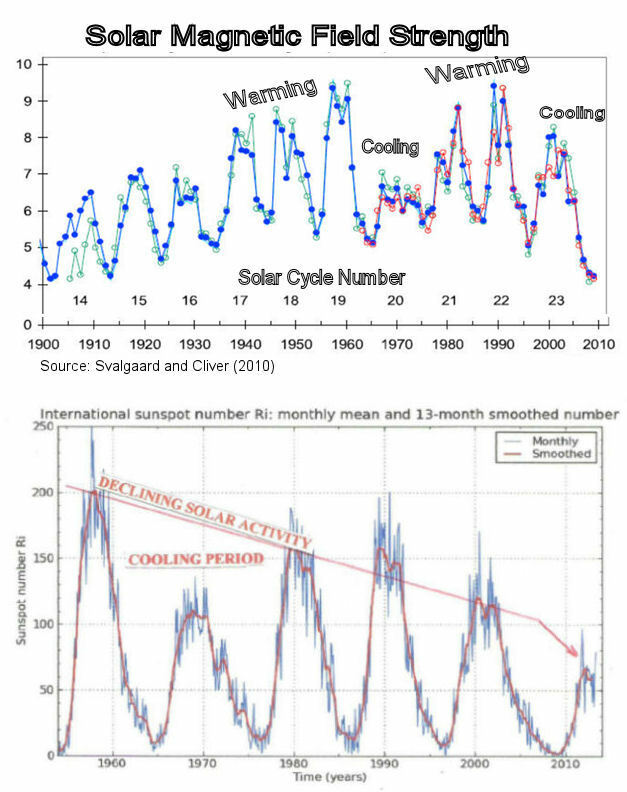 The IPCC claims that volcanic eruptions, low solar irradiance and internal variability explain the lack of surface warming over the period 1998 to 2012. Friends of Science reject this explanation showing that volcanic aerosols that cause cooling are measured by satellites. There were five large volcanoes during the period 1969 to 1995 that caused significant aerosol cooling, but no volcanoes since 1992 that could have caused a cooling effect. Friends of Science director Ken Gregory says, "The satellite data refutes this claim." Gregory explains that the IPCC makes a vague claim that the expected heat accumulation might have gone into the deep oceans, somehow by-passing the upper ocean layer. The original models did not including this incredible proposition. No mechanism is offered explaining how heat could move into the deep ocean without heating the surface, and there is no way for heat in the cold deep oceans to return to the surface. Friends of Science explain that the draft IPCC summary delivered to government representatives stated "[Climate] Models do not generally reproduce the observed reduction in surface warming trend over the last 10 –15 years" – meaning previous predictions of warming were wrong. The public may be surprised to learn that this accurate statement was deleted from the final summary. A Sept. 23, 2013 Spiegel Online article confirmed that the German Ministry of Research wanted any discussion about the global warming hiatus left out of the Summary for Policy Makers (SPM), claiming that the truth "would result in a loss of the support necessary for pursuing rigorous climate policies. Climate policy needs the element of fear". According to Gregory, the last 16 years isn't the only problem with the climate models. IPCC reports drive public policy on energy issues. In the UK, the government has been rocked by fears of power blackouts and rising energy prices, due to their “rush-to-renewables.” Rising energy costs have pushed manufacturing offshore and made unemployment worse according to an October 8, 2013 report in the Daily Mail. “Countries are facing these crisis situations because they relied upon previous IPCC reports of climate change catastrophe,” says Gregory. Dr. John Christy on Sept 12, 2013 in the Daily Mail compares climate model runs versus weather balloon and satellite observations in the tropical mid-troposphere. It shows the climate model trend since 1979 is more than five times the trend of the observations. Dr. Roy Spencer writes "I frankly don’t see how the IPCC can keep claiming that the models are 'not inconsistent with' the observations. Any sane person can see otherwise." Friends of Science quarterly newsletter of October 1, 2013 exposes the IPCC claims concerning the reasons for no-warming for 16 years. New three year members joining Friends of Science will receive a CD gift of jazz – membership forms on-line (offer void where prohibited).